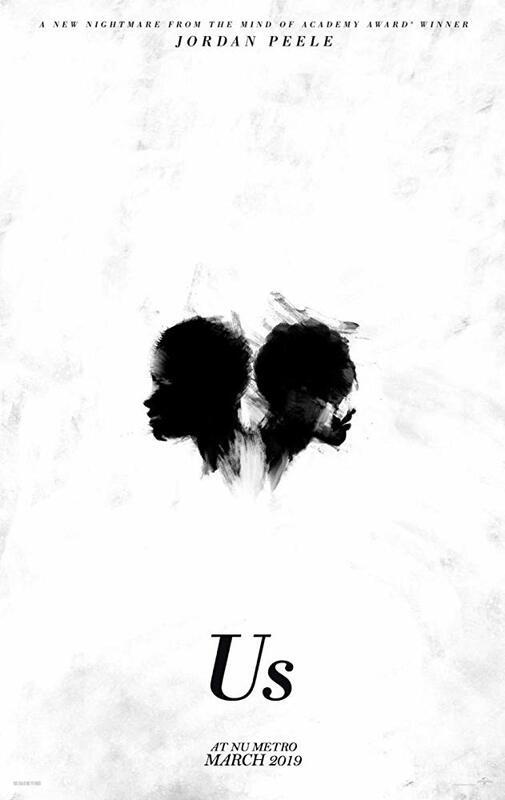 “Us”, an invasion thriller that turns into a critical look at the American class divisions, marks the second feature of Jordan Peele. What’s the legacy of “Get Out” and does “Us” live up to the expectations? 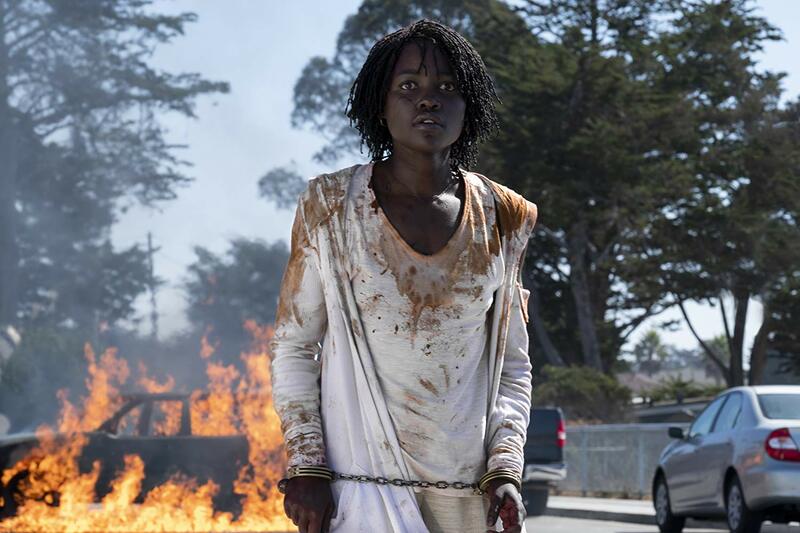 Can we already call Jordan Peele the contemporary horror mastermind? 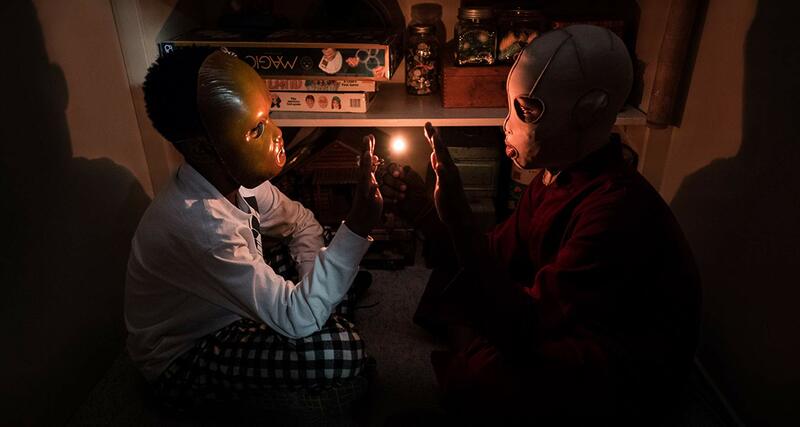 Even before its premiere at this year’s SXSW, some people were already raving about the greatness of the new horror flick of Jordan Peele “Us”. Only a certain kind of filmmaker can start the hype train with not more than his previous film, without the backing of a big studio to run a marketing campaign. Peele managed to gain a gigantic cult following with “Get Out” – a directorial debut, which brought him an Oscar. Before the horror fascination got into making, Jordan Peele was best known for his work on the show Key & Peele. Along with Keegan-Michael Key, the duo ran their comedy series for five seasons, reaching 55 episodes and receiving acclaim by two Primetime Emmys. In 2012, when the series first aired on Comedy Central, nobody could suspect that one of these two jokesters will, in a few years, become an icon of scary movies double-barreled with symbolism. “Get Out” told the story of Chris (Daniel Kaluuya), an Afro-American who visits his white girlfriend’s parents for the first time. The family, an upper-class American citizens, surround themselves with servants (who hint Chris at the wrongdoings taking place in the mansion). Soon, the story reveals a kind of sci-fi plot (inspired by “The Stepford Wives”), which includes trading bodies and switching minds. However, beneath the bonkers horror concepts lies a look at the problem of American racism – dressed in grotesque macabre, but nonetheless poignant in the bigger canvas. Surprisingly, Peele’s film tamed the unfavorable waves of horrors often overlooked in the awards season. Contrary to many groundbreaking fellow scary movies – like “The Witch”, “Split”, “Enemy” or later on, “Hereditary” – “Get Out” stirred enough interest and fascination to keep its momentum going. Fans went crazy, digging into details and finding hidden messages and Easter Eggs in almost every scene, with the outcome of “Get Out” being the topic of discussions throughout the entire year (since its early 2017’s premiere). Did “Get Out” deserve its popularity? To be fair, “Get Out” wasn’t as groundbreaking as it’s widely considered. At least not plot-wise. If you dig as deep as a low-budget horror movie dating back to 1941 called “The King of Zombies”, you’ll find yourself viewing “Get Out” from a much less innovative angle. The story, using the class differences to talk about the times of slavery and its hidden forms in a post-slavery era, was already told in the early 40s. And given a similar concept in “The Stepford Wives”, Peele’s film was a kind of retelling, rather than a bliss of something totally uncanny and unknown to the audiences. But what turned “Get Out” into a true gem was the way it built the tension of its protagonist by turning him into an alien among others. “Get Out”, while obviously talking about racist prejudices, works for every viewer – Chris is treated with hostility and the palpable feeling of unease that turns him paranoid is very much understandable to us all. And that’s what made “Get Out” so great – it worked as a horror because of how universal the dreadful feeling of danger was. Naturally, “Get Out” elevated Jordan Peele’s status to “one of the hottest in the genre”. 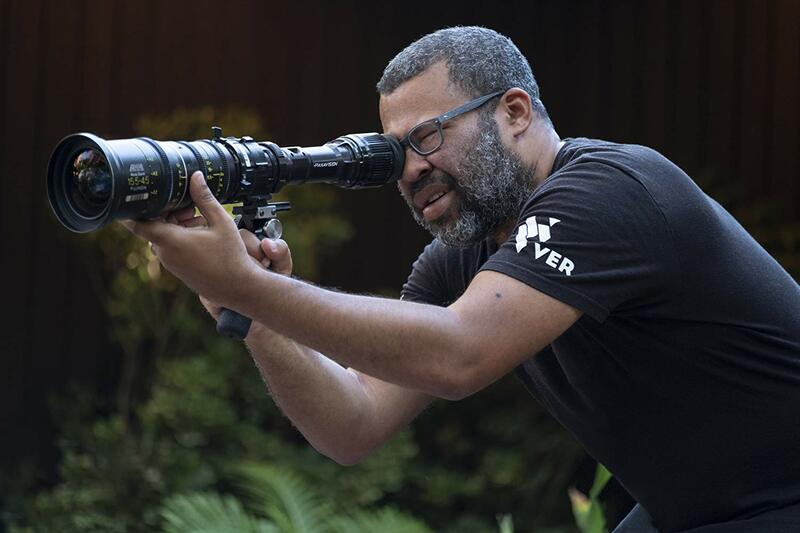 The movie was bursting at the seams with its sharp style and the auteur approach, and given the sublime depth that Peele showcased, “Get Out” soon needed its successor to feed the fans’ hunger. The 2019’s “Us” extracted parts of “Get Out” to tell its own story. The protagonist here is Adelaide (Lupita Nyong’o), a happy wife and mother of two kids. As a kid, Adelaide went through a traumatic experience in a theme park by the sea, which made her scared to death and caused a long-lasting fear induced by beaches and theme parks. When she and her family travel to spend a relaxing getaway weekend in a by-the-shore cabin, they soon find themselves stalked and terrorized by a group of scissor-wielding, dressed-in-red doppelgangers. At this moment, I feel the necessity to warn you there are spoilers to “Us” coming below. I left the screening of “Us” with a completely different feeling than the one after “Get Out”. The first film of Peele has crawled under my skin, making me feel deeply unnerved – it’s a powerhouse of a genre movie, assembled from pieces with great integrity throughout the whole run-time. “Us”, on the other hand, left me somehow baffled. Let’s begin with the plot. Peele begins with a brief introduction of the main character’s past. Soon, the film gets on its main track, embracing the vibe of “The Strangers” or “Funny Games”, when a group of terrifying lookalikes strikes and plays a game of wicked terror with the protagonist’s family. The first part of the film, loaded with comedy bits, is a spectacle of Lupita Nyong’o, who shines in a doubled role as both the main antagonist and protagonist. Within an hour, the actress establishes a fantastic scale to her performance, which enriches “Us” greatly. The thriller tension keeps you stiff and invested. Then, the doppelganger home invasion turns into a mass-organized weird happening, and “Us” begins to melt its own steel backbone. The first group that attacks Adelaide’s family takes their time before casting the final smite, yet meanwhile a couple of friends and their two daughters, attacked in the same area by their doppelgangers, is killed off in a blink of an eye. Why such a big difference? It’s not really clear. Soon afterwards, Peele presents the great reveal (this is a massive spoiler). The lookalikes were clones of people form the surface, kept in the intricate system of tunnels that spreads across the entire country. Whoa – didn’t see that one coming, I thought to myself as the last fifteen minutes made me more puzzled. The result is that this entire attack is a symbol of loosing the shackles of the Marxist American society. It takes a form of a nation-wide bloody performance. Yet, instead of a thoughtful explanation, Peele pulls the wool over our eyes by pyramiding the details and plot twists without a clear pattern. 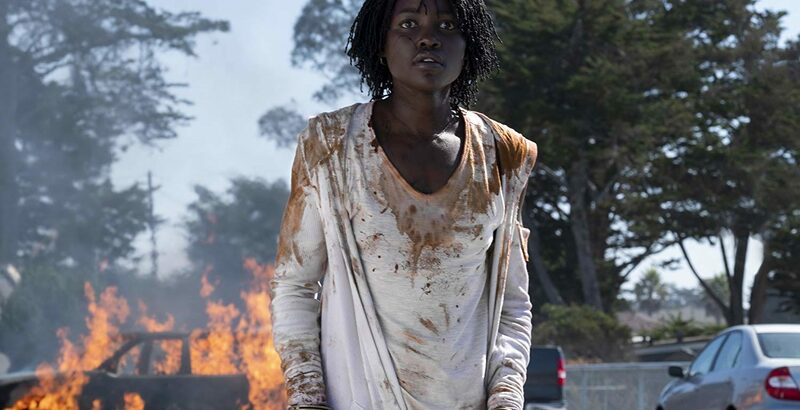 It’s easy to be astonished at first, but give it a solid few hours of thinking and a sad truth’s revealed – the more Jordan Peele’s elaborates in “Us”, the more blemishes appear on the whole undertaking. I think that the main problem here is that Peele wants “Us” to be a lot of things. It’s supposed to be a home invasion movie, but more intelligent and dodging genre cliches. A tale about the oppressed taking their rights to live with dignity, reaching for lives they wee never supposed to taste. A film about fighting your traumas and getting over them. A lecture on how people in America are still divided, based on class divisions, even in the times of democracy. A black comedy. Peele had a great idea (which turns out to be a concept from a “Twilight Zone” episode that Peele loved) to begin with. People living like sheep, purposeless and left to die out in a gruesome, terrifying manner, were organized by one person from the upper world to take what’s they believe belongs to them. The idea was expanding and expanding, spreading like the mass massacre across too many sheets of paper and eventually losing its spine. But having said all that, even despite the murky message and the storytelling issues, I do get the love for Jordan Peele. He’s hungry for horror that induces fear to make people think. Horror that questions labels, divisions and social issues. Horror that feeds on things like prejudices and jealousy. And in that, I understand and applaud Jordan Peele. Horror genre has been in a philosophical descent for years. The popularity of mind-numbing slashers, wacky ghost stories with no depth and all sorts of other half-baked produces – they all turned a fantastic genre into the most brainless form of entertainment. Jordan Peele, even if both “Get Out” and “Us” lean toward horror comedies, strikes gold by imbuing his films with metaphors and symbols. I might not be flabbergasted by his second installment in the Afro-American horror universe, but he’s going to bring us more diamonds like “Get Out”. Hopefully, more structured but not less poignant on the social level. Want to find a list of the most expected films of 2019? Click here!